Burnbrae Gardens nutritional care manager Tiffany Maynes. CAMPBELLFORD, Ont. 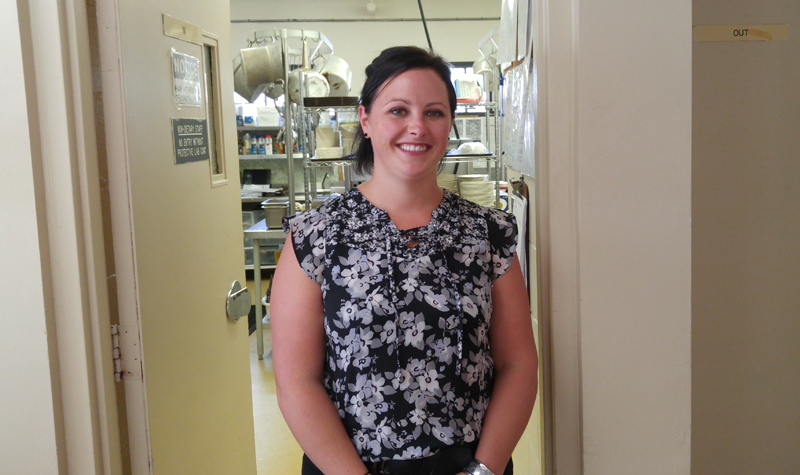 – Tiffany Maynes jumped from being a food service worker at Burnbrae Gardens to becoming the Campbellford long-term care home’s nutritional care manager (NCM) in less than a year – a change she says was both “scary” and exciting. She began her career at Burnbrae Gardens about a year and a half ago. Seven months ago Tiffany was awarded the nutritional care manager position. “It was scary, I would definitely say, but I have had great support from both staff and management – they are always there to support me in the right direction,” Tiffany tells The OMNIway. Before taking a job at Burnbrae Gardens, Tiffany worked as a restaurant server for 12 years. Then she decided she wanted a career change, so she enrolled in Fleming College’s food service worker program. After completing the program, Tiffany saw an ad for a dietary aide position at Burnbrae Gardens, so she applied and got the job. Less than a year later she was awarded the NCM position when it became available. Promotion from within is also an important part of the work culture at OMNI Health Care long-term care homes. Tiffany says she’s enjoying the nutritional care manager position, noting her transition has been smooth, thanks to her experience working at previous jobs in the food service industry and the support she has received from colleagues. “I was already doing a lot of the things I do now in previous jobs,” she says. Burnbrae Gardens administrator April Faux says Tiffany has fit well into a managerial role at the home. “She has been awesome; she has fit into the team perfectly and the girls in the kitchen really like her – she has been wonderful,” April says.